"Why is the government considering polar bears for the endangered species list while their population approaches an all-time high?" A short interview from the online edition of the Wall Street Journal answers this question. Though the issue of global warming has a number of complexities, two items are not complex: the population of polar bears is approaching an all-time high and environmentalists want to rewrite laws to accommodate climate change. In two previous post, I imply that the issue of global warming is overdone: "Power Line: Headline of the Day" and "Sun, Not Man, Main Cause of Climate Change." As the political climate heats up over this issue, I am still a skeptic. To get a glimpse of the environmental nonsense associated with polar bears and global warming, check out this short interview editorial. One of the recent creationist websites that I regularly read is Creation on the Web. An article caught my attention last night with its opening paragraph. “A creationist inquirer plays devil’s advocate and asks why we bother with apologetics, or defending the faith, at all, whether presuppositionalist or evidentialist. Dr Jonathan Sarfati responds, pointing out the biblical commands to defend the faith, as well as examples in Scripture. And we show examples of many people coming to faith in Christ after honest questions were answered. Conversely, refusal to answer honest questions helps feed the sceptical claim that Christians really have no answers.” While Dr. Sarfati’s response goes back to 2005, Creation on the Web posted it yesterday and it is still relevant in 2008. 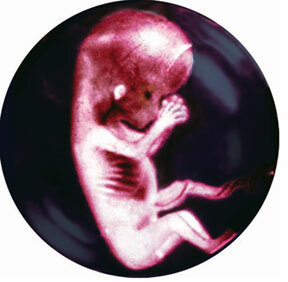 The above picture is an eight-week old "fetus" (taken from http://www.pathlights.com). In looking at the picture, I think of two items. First, it is better to think of the above fetus as a baby rather than some type of immaterial substance. The baby in this picture looks human. And, this should not surprise a Christian for the Bible presents unborn babies as being fully human from the time of conception. For example, David describes himself as being sinful from the time of conception in Psalm 51:5 (for more biblical support, click here, here, here and here). Just looking at this picture should convince anyone of the baby’s humanity. And, if the baby is considered human, it also follows that it would be an act of murder to terminate this helpless child’s life in the first trimester of his life. If you are in doubt about this assessment, you need to look at the following graphic video at Justin Taylor’s blog: "This Is Abortion." Second, I am reminded that a presidential election is just around the corner. As the presidential candidates for both Republicans and Democrats do battle to represent their respective parties in the 2008 election, it is good to remind ourselves that one of the moral issues involved in the upcoming election is the issue of abortion. To be certain there are other significant issues involved with this election, such as the major issue related to the type of judicial appointments a president would make, but the issue of abortion has not gone away. Since today is the 35th anniversary of Roe v. Wade, we need to keep in mind with our vote in the next election that we must vote for a candidate that reflects the core moral values as reflected in the Bible. In keeping with this responsibility, we should check out where each respective candidate stands on abortion. For information on where each candidate stands on Roe v. Wade, click here to see each candidate’s position. May God help us in the next election to think beyond our wallet to those biblical values that glorify God. Are Chimps Destined for Human Rights? 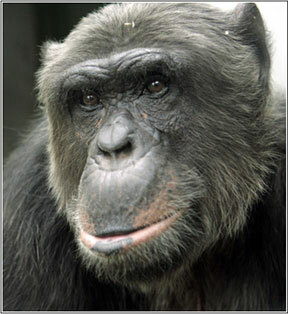 The chimp has quite a facial profile. How do Bible-believing Christians respond to questions about abortion and ethics? Creation on the Web has posted a response to a letter about these issues. Check out the post “Questions Regarding Abortion and Ethics” by Dr. Jonathan Sarfati. I read this CNN article today: “Bush drilling plan could threaten polar bears, panel chairman says.” When it comes to oil, you can see why we are under the control of other countries. 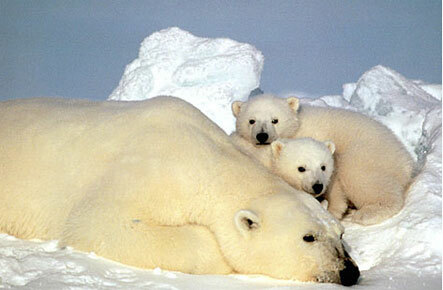 Democrats put Polar Bears before our country’s security. This is such a sad commentary on our political milieu that it made Power Line’s Headline of the Day. John Hinderaker’s post summarizes the issues well: “This is what happens when committee chairmen are all Democrats. National security? Ho-hum. The economy? Who cares? Polar bears? Now, there’s a crisis!” Don’t miss reading this brief post. Creation on the Web has recently posted an interesting interview with Christian surgeon, Dr. Vij Sodera. This interview was initially done by Philip Bell and Tim Matthews, and appeared in the magazine Creation (29 [December 2006]: 52–54). Dr. Sodera was born in India and has resided in England since he was four years old. He went to school at St Clement Danes Grammar School in London, while gaining major scholastic awards for academic achievement and art, and he graduated with distinction in chemistry from Sheffield University Medical School in 1975. In 1981 Dr. Sodera became a Fellow of the Royal College of Surgeons of Edinburgh. For 19 years he was in charge of a Minor Injuries Department in West Sussex and has run, since 1987, his own private Minor Surgery clinic, “The White Lodge Clinic.” He has also written a formidable book, One Small Speck to Man: the Evolution Myth (Vija Sodera Productions, 2003). “If God can do anything, then can He make a being more powerful than Himself?” This is a twist on an “old trick question: ‘If God can do anything, can He make a rock too heavy for him to lift?’ or ‘ … can He make two plus two equal five’ or ‘make a square circle’, etc.” According to Dr. Jonathan Sarfati the basic answer to this question is “An all powerful God can do or make anything, but it’s meaningless to say that he can do or make a nothing. A logically contradictory state of affairs is not a thing at all, but NOTHING.” You can read more details in his article “If God can do anything, then can He make a being more powerful than Himself?”. As the journal’s editor-in-chief, Dr. Andrew A. Snelling, explains: “For many years I have had a vision for an online technical journal publishing the very best creationist research at the highest possible professional level and presentation. Previously the best creationist researchers had to wait for four or five years for the next International Conference on Creationism to submit their papers to a forum and publication in which they could be assured of the highest standards of peer review, presentation, and dissemination. Furthermore, the paper (rather than online) publication of the ICC Proceedings has restricted the dissemination of this top-quality research. Even though the ICC is now moving to concurrent electronic publication, timely dissemination is still restricted and delayed by cost considerations…. It is my hope that now, because of both the rapid publication we will be offering in the Answers Research Journal (within two to three months of receipt) and the free-of-charge online publication to ensure the widest possible dissemination of their cutting-edge research results, leading creationist researchers around the world will make publication in the Answers Research Journal their first consideration. 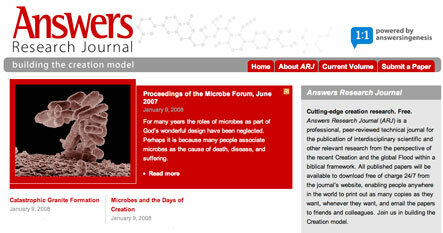 In this way I am confident the Answers Research Journal will quickly be at the forefront in setting the trend for online creationist technical publications, a ‘must-see’ for all serious creationist researchers and students.” To examine AIG’s new journal, go to Answers Research Journal.